Laser Cutting has changed what we can do for you! Gleicher’s laser cutting process has helped to expand design capabilities by giving engineers the aptitude to cut a variety of different patterns and shapes with extreme precision. CAD design & programming allows you to completely customize your materials for any production application. 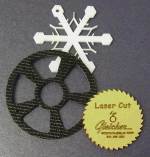 Laser cutting processes offered by Gleicher Manufacturing can help your product meet exacting specifications. Laser cutting is perfect for testing pre-production part designs. Send us your drawing (.dxf preferred) and Gleicher can cut Pre-production parts often in a week or 2, starting at $150.